Dennis Moore, Pharm. D., and Jordan Weaver. M.D., prepare to cut the ribbon and officially open the new Family Medical Center in Batesville. 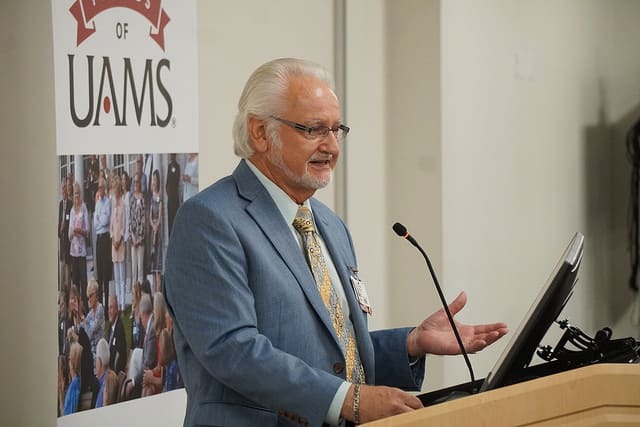 Aug. 28, 2018 | The University of Arkansas for Medical Sciences (UAMS) today celebrated the expansion and new home for its UAMS North Central Regional Campus and Family Medical Center in a recently remodeled, spacious and up-to-date facility near White River Medical Center in Batesville. The Family Medical Center at 1993 Harrison Street recently began serving patients from the north central region of Arkansas, which includes the counties of Marion, Baxter, Van Buren, Fulton, Sharp, Izard, Cleburne, Stone, Searcy, Independence and White. UAMS Chancellor Cam Patterson, M.D., M.B.A., speaks to an audience gathered for the official opening of the new Family Medical Center in Batesville. 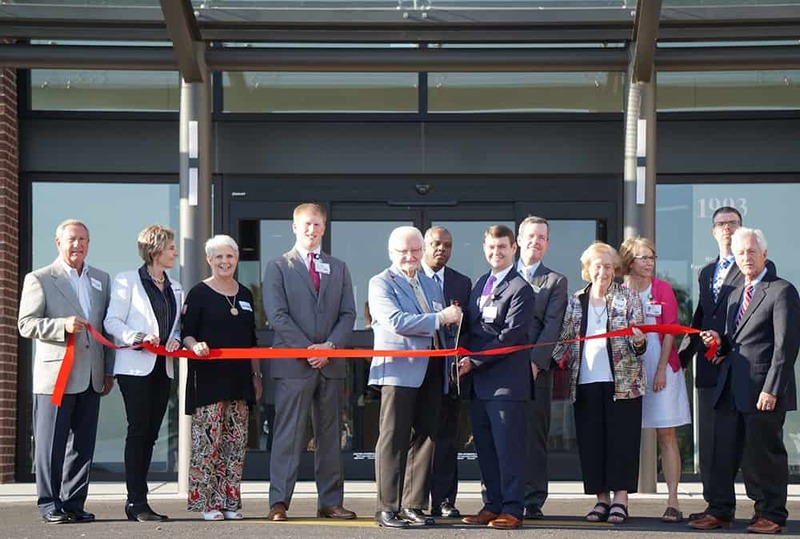 State legislators, local dignitaries, UAMS Chancellor Cam Patterson, M.D., MBA, and UAMS officials were on hand for the ribbon cutting at the $5.5 million facility that provides space for the new UAMS North Central Regional Campus, its programs and its future growth. The other seven Regional Campuses are UAMS Northeast in Jonesboro, UAMS Northwest in Fayetteville/Springdale, UAMS South in Magnolia, UAMS South Central in Pine Bluff, UAMS Southwest in Texarkana, UAMS West in Fort Smith and UAMS East in Helena-West Helena. Other dignitaries at the event included Batesville Mayor Rick Elumbaugh and state Rep. Michelle Gray of Melbourne. UAMS North Central Regional Campus, a part of the statewide UAMS Regional Campuses since 2007, provides clinical care and health education services and will train medical residents in primary care. The UAMS Family Medicine Residency Program in Batesville plans to receive the first residents in July 2019. The program will admit six residents per year until reaching a total of 18 residents in 2021. Moore speaks at the opening. The construction was provided by White River Medical Center, and UAMS will lease the property from the medical center. Two well-established family practice physicians, Jordan Weaver, M.D., and Julia Roulier, M.D., recently moved their practices into the new clinic. Weaver serves as the program director. Roulier also has teaching experience. Both physicians will continue to provide care in the clinic as well as training the next generation of family practice physicians for the region. With the remodeling of what was previously a retail space, UAMS North Central Regional Campus has about 23,000 square feet of clinic and education space. The new Family Medical Center has 24 exam rooms and multiple areas for team-based care, which includes physicians, nurses, pharmacists and other clinical professionals. The educational building contains multiple conference rooms and educational spaces to allow for community meetings and distance education using interactive video.